Unabridged & Original version with all 708 pages Includes: 15 Illustrations and Biography Dracula is an 1897 Gothic horror novel by Irish author Bram Stoker. 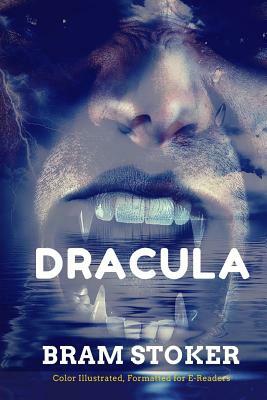 Famous for introducing the character of the vampire Count Dracula, the novel tells the story of Dracula's attempt to move from Transylvania to England so he may find new blood and spread the undead curse, and the battle between Dracula and a small group of men and women led by Professor Abraham Van Helsing. Dracula has been assigned to many literary genres including vampire literature, horror fiction, the gothic novel and invasion literature. Although Stoker did not invent the vampire, he defined its modern form, and the novel has spawned numerous theatrical, film and television interpretations. The story is told in epistolary format, as a series of letters, diary entries, and ships' log entries, whose narrators are the novel's protagonists, and occasionally supplemented with newspaper clippings relating events not directly witnessed. The events portrayed in the novel take place largely in England and Transylvania during the 1890s. The tale begins with Jonathan Harker, a newly qualified English solicitor, visiting Count Dracula in the Carpathian Mountains on the border of Transylvania, Bukovina, and Moldavia, to provide legal support for a real estate transaction overseen by Harker's employer. At first enticed by Dracula's gracious manners, Harker soon realizes that he is Dracula's prisoner. Wandering the Count's castle against Dracula's admonition, Harker encounters three female vampires, called "the sisters," from whom he is rescued by Dracula. After the preparations are made, Dracula leaves Transylvania and abandons Harker to the sisters. Harker barely escapes from the castle with his life. Not long afterward, a Russian ship, the Demeter, having weighed anchor at Varna, runs aground on the shores of Whitby. The captain's log narrates the gradual disappearance of the entire crew, until the captain alone remained, himself bound to the helm to maintain course. An animal resembling "a large dog" is seen leaping ashore. The ship's cargo is described as silver sand and boxes of "mould," or earth, from Transylvania. Soon Dracula is tracking Harker's fiancee, Wilhelmina "Mina" Murray, and her friend, Lucy Westenra. Lucy receives three marriage proposals from Dr. John Seward, Quincey Morris, and the Hon. Arthur Holmwood (later Lord Godalming). Lucy accepts Holmwood's proposal while turning down Seward and Morris, but all remain friends. Dracula communicates with Seward's patient Renfield, an insane man who wishes to consume insects, spiders, birds, and rats to absorb their "life force," and therefore assimilate to Dracula himself. Renfield is able to detect Dracula's presence and supplies clues accordingly.